Jerusalem Talmudist; bibliophile; born at Pinsk, in the government of Minsk, Russia, in 1844. As a boy of three he accompanied his father, Jacob Mordecai Hirschensohn, to Jerusalem, and from him he received instruction in the Talmud. Hirschensohn was an ardent bibliophile, and collected a valuable library of Hebrew books. He treasured also rare and valuable manuscripts, to publish which he founded a printing establishment. Among the important works published by him were: R. Nissim bar Reuben (RAN; c. 1350), on the treatise Megillah (Jerusalem, 1883); "Bet ha-Beḥirah," by Menahem bar Solomon of Perpignan (second half of the thirteenth century), to the treatise Yoma (ib. 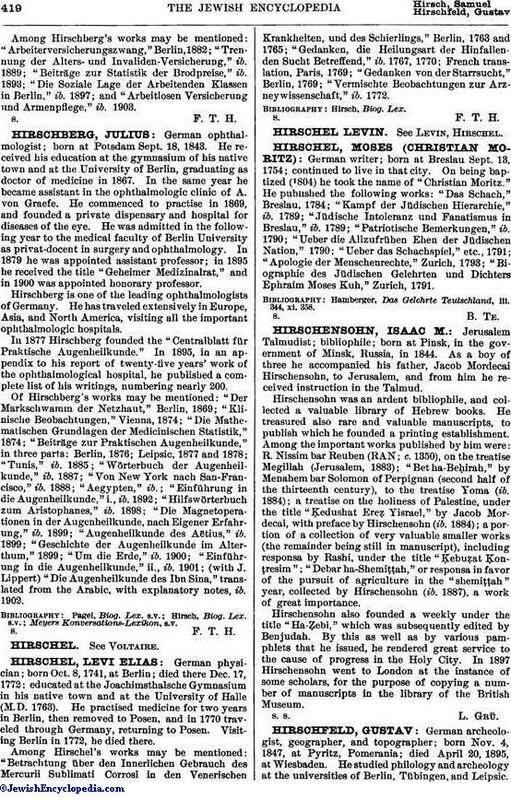 1884); a treatise on the holiness of Palestine, under the title "Ḳedushat Ereẓ Yisrael," by Jacob Mordecai, with preface by Hirschensohn (ib. 1884); a portion of a collection of very valuable smaller works (the remainder being still in manuscript), including responsa by Rashi, under the title "Ḳebuẓat Ḳonṭresim"; "Debar ha-Shemiṭṭah," or responsa in favor of the pursuit of agriculture in the "shemiṭṭah" year, collected by Hirschensohn (ib. 1887), a work of great importance. Hirschensohn also founded a weekly under the title "Ha-Ẓebi," which was subsequently edited by Benjudah. By this as well as by various pamphlets that he issued, he rendered great service to the cause of progress in the Holy City. In 1897 Hirschensohn went to London at the instance of some scholars, for the purpose of copying a number of manuscripts in the library of the British Museum.